Andre broke down when he told the court that he found out at the scene that Teresa, Martin and their son Rudi had died. 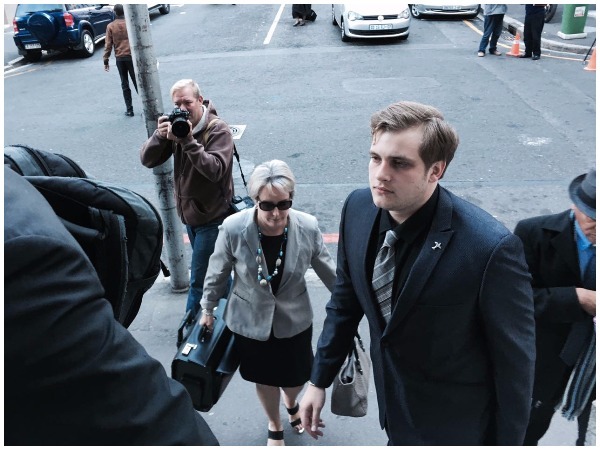 Henri van Breda was emotional when his uncle saw him on the day his parents and brother were murdered, André du Toit testified in the Western Cape High Court on Tuesday. André, Teresa van Breda’s older brother, said when Henri returned from the Stellenbosch detective’s office with Marli’s then-boyfriend, James Reade-Jahn, James’ father Ron and Henri’s friend, their reunion was emotional. "We didn’t talk a lot. We know when he speaks fast, he stutters. He speaks slowly. We hugged and cried," he told Judge Siraj Desai. He agreed that this was in contrast to the testimony of Dr Michelle van Zyl who later examined him and described Henri as calm. Henri (22) is on trial on charges of murdering his parents Martin (54) and Teresa (55) and brother Rudi (22) with an axe, attempting to murder his younger sister Marli, and defeating the ends of justice. He has pleaded not guilty, claiming a balaclava-clad man attacked the family in their home in the De Zalze Estate, Stellenbosch, in the early hours of 27 January 2015, before escaping. The Du Toits are the Van Breda family’s only relatives in the province, and Du Toit has been attending proceedings regularly. He said on the morning of the murders, he was contacted by the estate manager to go to De Zalze as quickly as possible. When he arrived, he found a number of police vehicles outside 12 Goske Street. The property was surrounded by yellow police tape. Station commander, Colonel Damon Beneke introduced himself to him while he stood outside the house, and the first question he was asked was what the family’s relationship was like, Du Toit testified. “I replied that I don't know of any problems,” he recalled. He later heard that Henri had been taken to the police station and Marli to the Stellenbosch Mediclinic. He and his wife, who later joined him, were not allowed to see Marli at the hospital and were told that she was being transferred to Vergelegen Mediclinic. "[At the hospital they told me] there were better doctors for her there and they didn't want us to see her in that condition," Du Toit said. They then went to the Stellenbosch police station and asked to see Henri. They weren’t allowed to and apparently weren’t given a reason for this. They didn’t give Henri any food or clothes, he said. Andre said they then contacted the Reade-Jahns and went to their home in Somerset West, and Henri later arrived, later followed by his then-girlfriend Bianca van der Westhuizen. Their reunion was also very emotional. Andre later left with the family dog, Sasha, and Henri decided to stay behind so that he could be close to Marli and go and see her in hospital the next day. Henri had requested this himself, Du Toit said. Andre said his wife had seen Henri’s wound and had told him that the cut looked deep, encouraging him to go to hospital for stitches. He didn’t agree with district surgeon, Dr Lizette Albertse and Dr Van Zyl’s opinion that it wasn’t required. Andre’s testimony formed part of a trial-within-a-trial to decide the admissibility of Henri’s initial statement given to police shortly after the murders. Defence advocate, Pieter Botha argued that police had already seen his client as a suspect and that he was entitled to be warned that he did not have to make a statement had the right to consult a lawyer, and to remain silent. Sergeant Clinton Malan, who took the statement on the day, said Van Breda was not informed of his rights as he was being questioned as a witness, not as a suspect. Closing arguments in the trial-within-a-trial are expected on Wednesday.